Andrew Bick (b. Gloucestershire, UK, 1963) received an MA in painting from the Chelsea School of Art (1988) and has since shown extensively in Europe and the U.S. Bick lives and works in London. Bick's works are executed from a combination of oil paint, marker pen, wax, acrylic paint and Perspex. The works play with elements of flat colour, depth and surface, revealing the process of painting as a series of strategies or components within the visual puzzle of the whole. 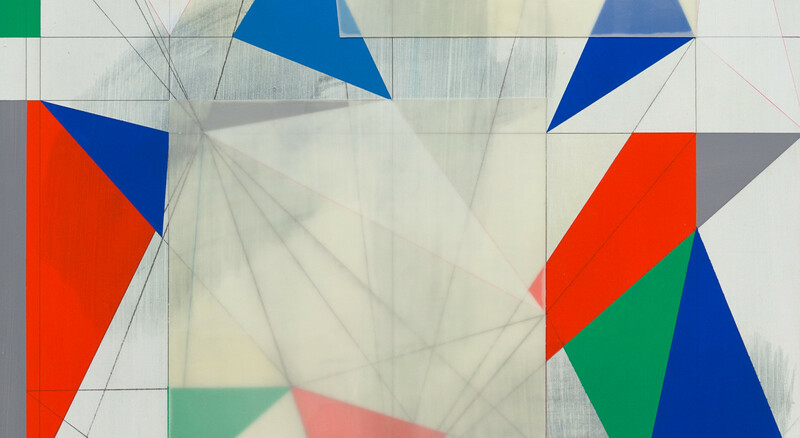 Bick's paintings call into question false opposites, and contrast hard geometric or blunt graphic forms with uncertain or dashed-out strokes or patches of scrubbed brushwork. Within the abstract geometry of his works, he combines matte and glossy surfaces, different textures, colour and 'non-colour'. His work has been described as 'gently disruptive and purposefully chaotic'. In Bick’s view, new versions of the abstract, concrete and constructive, necessitate the repetition of banal information, leading to an unexpected conjuncture of word and image. His work is based on the belief that disruption within a system helps us relearn the process of paying attention. Mediated layering of geometry and gesture act as an antidote to a world of instantaneous information. It is evident that the paintings are made laboriously, testing how far he can take the medium. Bick pays close attention to the formal processes of painting as well as the legacies of constructivism, systems art and concrete poetry. He has developed a cyclical correlation between resources, academic research and approaches for painting. Despite historical research being at the forefront of the artist’s practice, he paints very much in the present, highlighting the canonical to subvert the rules. Gently deconstructing what has come before with deft humour, Bick uses systems not to predetermine the outcome, but to conjure new ways of thinking and to develop different results. The works act as a re-evaluation of constructivism and systems art, simultaneously celebratory and disruptive. 2018 saw the unveiling of Andrew Bick’s architectural commission for The Crown Estate’s shopping precinct, Princes Arcade. Made in collaboration with Modus Operandi and Rolfe Judd Architects, For Marlow Mossis a celebration of Bick’s engagement with the overlooked artist, taking delight in the possibilities of re-evaluating the historical cannon. As part of this commission, Bick has also made a pocket square with Drakes Menswear, which reflects Marlow Moss’s name change from Marjorie and her preference for wearing men’s clothing. Opening early in 2019 will be Andrew Bick’s latest exhibition, Jetzt ist immer auch ein bisschen gestern und morgen zeigen, at Museum Haus Konstruktiv (Zurich, Switzerland). Alongside the exhibition, a monograph of his work will be published in collaboration with the Director of the museum, Sabine Schaschl. Bick was a research fellow at the Henry Moore Institute (Leeds, UK, 2007), was the recipient of the Premio Internazionale Fiar (1992), and shortlisted for the NatWest Art Prize (1999) and the Jerwood Painting Prize (1998). Selected exhibitions include Von Bartha (Basel, Switzerland), Bluecoat Liverpool (UK), Museum Haus Konstruktiv (Zurich, Switzerland) Stiftung Konzeptuelle Kunst, (Soest, Germany), Kunstalle Palazzo (Liestal, Switzerland), Wilhelmshaven Kunsthalle (Germany), Niederrheinischer Kunstverein (Wesel, Germany) and Pizzuti Collection (US). Bick’s work can be found in numerous collections including the British Library (UK), British Museum (UK), Victoria & Albert Museum (UK), New York Public Library (US), Yale Center for British Art (US), Goldman Sachs, UBS, Simmons & Simmons, Roche Art Collection, Basel, and Museum Haus Konstruktiv (Zurich, Switzerland). Bick has curated several shows including: Conversations around Marlow Moss, & Model, Leeds (UK), The Conversation: Anthony Hill, Peter Lowe, Jeffrey Steele, Gillian Wise, Galerie Von Bartha Collection (Basel, Switzerland) Construction and its Shadow, Leeds City Art Gallery (UK); The Kingston Turnpike, the Stanley Picker Gallery (UK); Sight Mapping, Sala Rekalde, Bilbao (Spain) travelled to GoMA (Glasgow, UK) and Konsthallen Bohuslans Museum (Sweden).